In most organizations, digital marketing grew up in a silo, separate from the rest of the marketing department. That’s because initially digital touch-points like websites, email and online advertising were not seen as the heart of the business. But today the world has changed. Digital channels, content and technology are influencing people’s buying decisions in all markets, at every stage of the customer life-cycle. In this blog post I want to share you my thinking on how IT and marketing should forge a partnership to keep up with the challenges of the modern organization, doing business in an evermore digitalizing world. Marketing today has become a digital profession. I hope you agree. Marketing budgets and investments in technology are also dominantly in the digital space. That’s because consumers and buyers in general are shifting online, and as such the budget also follows that route. So that makes sense. According to research from Forrester, some 55% of organizations will be increasing both their digital budget along with the overall spend or shifting existing budget to digital, leaving digital with more to play with. 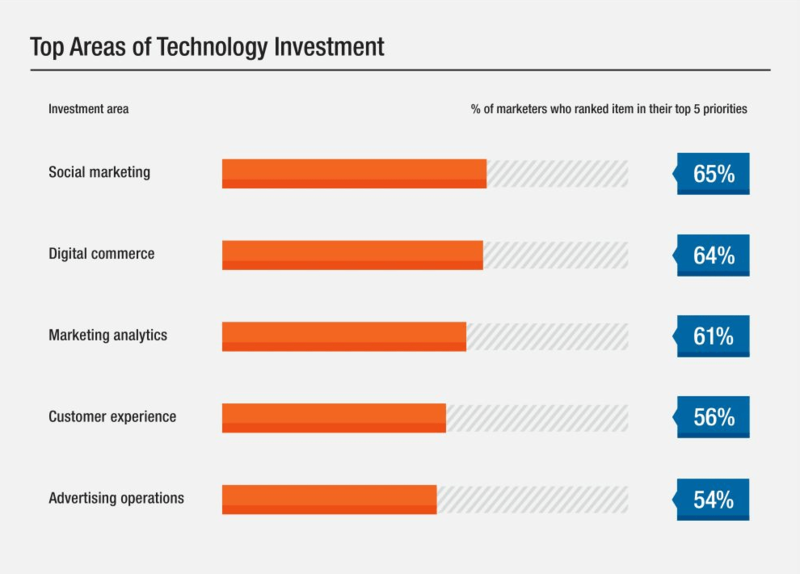 Marketing technology represents 33% of the marketing budget. This increase in budget is an absolute necessity for CMO’s and marketing leadership to keep up with the changing demands from the market. The last 5 years, the responsibilities of CMO’s have only grown, in which marketing has to tackle much more than the usual (brand, design, audience insight, content and communication). All of these new responsibilities require new software and new technology. And as such, also more budget is needed. With these added responsibilities the marketing function is building platforms, software, algorithms and systems that help them to achieve their marketing and business objectives. In 2012 Gartner predicted that the CMO will spend more on IT than CIOs do, as of 2017. I see this statement confirmed in 2016, in the Spend Survey of Gartner. The survey shows that larger companies are spending more on marketing technology than advertising in 2016. Scott Brinker draws a similar conclusion in a short blog post on the subject. Selecting and building platforms, software, and systems… This used to be the domain of the CIO. Therefore, a potential conflict arises between the CMO and the CIO. As the CMO increasingly makes choices on software, architecture, and technology, there is a potential rising conflict between marketing and IT. CMO’s want to empower their marketing teams to adapt rapidly to ever changing consumer demands and preferences. And they don’t want to rely on IT. CMO’s are drawn to solutions that enable marketing to truly control what happens on these marketing platforms, without the need for IT. Why does the CMO want to do this without IT? Because in the old days, marketing had to send requests to IT and wait for the IT department to have the bandwidth to address needs or implement features. Not anymore. And that’s the first source of conflict. IT is losing control over what gets selected, how it is used, and sometimes also even how it is integrated in the architecture. The perceived risk is that IT is demoted to solving IT networking issues and keeping old legacy systems alive. Wrong of course, but still, the potential conflict is there. Another potential source of conflict is command and control. IT safeguards good operation and security by enforcing the user to follow strict rules. IT is used to deciding on platforms, because security, continuity and operational performance needs to be safeguarded. With CMO’s increasingly selecting SaaS platforms and Cloud solutions, this role of IT seems to be evaporating. And hence, a new potential source of conflict between marketing and IT. Are you ready for a partnership between Marketing and IT? As marketing, we know very little about the job of a CIO. And most probably, the same is true in the other direction. But smart CMO’s understand that it’s not possible for a CIO and CMO to work in isolated conditions. Without input from the CIO, CMOs could implement technology that may prove disastrous for the company’s data security. Likewise, CIOs may not choose the best marketing technology without a clear picture of marketing’s strategic direction, marketing goals, and business requirements. Plus, marketing produces greater volumes of useful data, so IT can play a valuable role in managing data and translating raw data into actionable insights. The CIO, on the other hand, must shift IT from being a cost center to being a business-revenue facilitator and enabler. In the big data era, the CIO is accountable for using technical infrastructure to enable and accelerate revenue growth. How to set-up a partnership between marketing and IT? Every environment will be different, I am sure. Some organizations have a natural behavior of adapting to this new reality, in an open spirit. Top leadership is shared behind a common goal. Other organizations have grown into a situation where IT is dominating and working together seems much harder. Change is hard, but necessary. You’ll have to find your own path to make this change happen. Install joined decision governance: An effective decision-governance framework makes clear how the CIO and CMO, and potentially other C-level executives as well as their respective leadership teams, must work together and support each other. Build the right teams and team setup: the creation of a center of excellence where both marketing and IT people work together. Provide transparency: meet regularly, biweekly or monthly, to review progress and keep the effort on track. Each quarter, they should have a frank discussion about the CMO–CIO relationship and how to strengthen and sustain it. One approach is to develop a scorecard that tracks project progress and identifies breakdowns. Hire IT and marketing “translators”: The CMO should hire someone who understands customers and business needs but speaks the language of IT. Typically that function is called Marketing Technologist today. The CIO needs to hire technical people with a strong grounding in marketing campaigns and the business side. Business-solution architects, for example. That’s it for this one. What do you think will happen with the function of CIO? 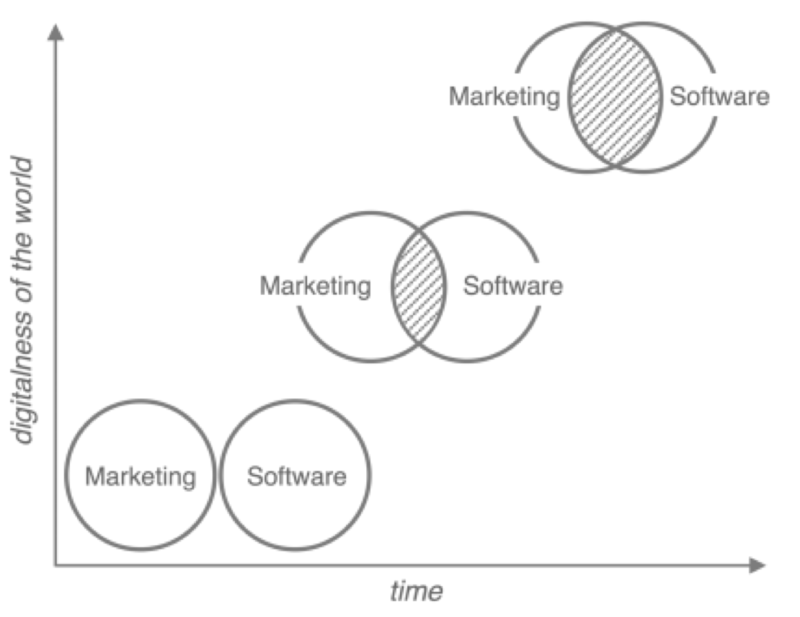 How should marketing forge a partnership between IT and marketing?